Over the years, I’ve owned about a half dozen different homes. What’s the first thing on my priority list when I move into a house with no garage? …Usually before the last of the boxes is unpacked from the move. Living in the snowbelt makes it almost mandatory for me to have a garage to protect the family vehicles as well as other motorized tools and equipment. As Jay Leno would likely confirm, there’s no such thing as too large of a garage! Did You Know?… By adding a garage, you’ll get more than an 80% return on your investment! Following are some things to think about when it comes to building an attached garage vs an unattached garage. Plus some ideas for finishing your garage (as opposed to leaving it unfinished) and choosing the best garage organization system for all of your stuff. If you’re still in the design and building phase, then by all means build the largest garage that you can afford within the space that you’ve got to work with. First, you will need to determine whether you want the garage to be attached to your house or a standalone structure. On the one hand, you may want a fully enclosed garage that will completely protect everything inside from the wind, rain, and snow. On the other hand, a simple garage structure could serve its purpose as little more than a shell to keep things out of the weather. If you have an attached garage, it may be required that at least a portion be insulated and sheet rocked. The common wall to the house must have a specific type of sheet rock — because it will serve as a fire stop protecting the house from a garage fire. If there is a bonus room above the garage, the ceiling will need to be insulated and sheeted with drywall as well. Generally, it’s common practice to completely finish the interior of an attached garage. Keep in mind that many people eventually convert attached garages into family living space down the road. If you have a detached garage, then you simply need to consider what the garage will be used for. If you’re intending to use it as a home workshop, a craft or hobby center, or even a home office, then you’ll need to add some electrical service, insulation, and a source of heat or air conditioning (depending on what area of the country you live in). For me, it means creating a well-lit comfortable space to work on my vehicles. For others, it may mean simply creating a space to get the car and lawn mower out of the weather. And for others, it could mean having a place for everything that won’t fit inside your home; in lieu of an attic. Since finishing your garage can include anything from bare sheetrock walls to painted walls, treated garage floors, and handy storage & shelving units — how you plan to use the space will ultimately determine how you decide to finish your garage. So, to what extent do you plan to finish the interior of your garage? Next, you need to find a garage organization system that works best for the amount of “stuff” that you have in your garage. Overhead storage has its good and bad points. With ropes and pulleys (or fancy brackets) you can get things off the floor. However, most garages have limited ceiling height. So you could be creating a head-knocking hazard with these items. The goal in hanging things up high is to open the space below them for other uses. Yet the temptation often to pile more stuff in this new found space instead. Thus, your garage could quickly revert back into the catchall that you were trying to avoid in the first place. Plastic storage containers and plastic shelves can make order from a pile of boxes. However, over time they may weaken, sag, or break. Then you’re right back to having a messy garage to deal with. Plastic storage cabinets have the same weaknesses, but if used for lighter items they can be ideal. They are usually cheaper than metal cabinets, but metal cabinets will last much longer. Not only will adding a garage increase your home’s value, but finishing the garage will also help to increase the value of your home. So when resale value is being considered, it makes sense to finish your garage to the greatest extent that you can afford. 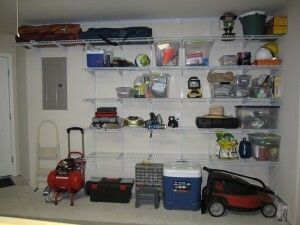 Keep in mind, when it comes to keeping your garage space organized, you usually get what you pay for. If you invest in cheap light-duty shelves and plastic cabinets, in time you’re likely to be right back where you started from with stuff piled high all over the floor. If you invest in good, strong storage cabinets and heavy-duty shelving, you will add value to your home and provide useful storage space for years to come. Have you seen the Versa Lift garage attic storage system? If you’ve got an attic above your garage, this type of hoist definitely makes a lot of sense. If you don’t have an attic above your garage, then you may want to keep this idea handy when you’re designing your next home!